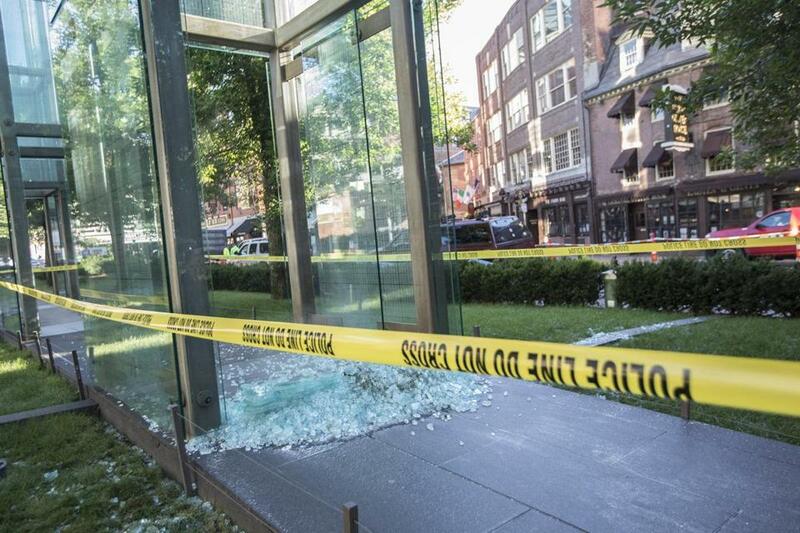 The New England Holocaust Memorial in Boston was vandalized twice in 2017. Hate crimes rose 9 percent in Massachusetts last year from 2016 and 17 percent nationwide, rising for the third straight year across the country, the FBI reported Tuesday. The 7,175 incidents reported nationally in 2017 reflect not only more crimes, but also more law enforcement agencies providing data to the FBI. Nearly 900 additional departments submitted data on hate crime in 2017 than had done so in 2016, according to the agency. The annual report does not detail crimes reported, but Massachusetts had a spate of incidents related to race and religion last year. The New England Holocaust Memorial in Boston was vandalized twice. White supremacist graffiti was spray-painted on a Marblehead causeway. Students at a Norfolk high school were suspended for harassing a classmate and the student’s mother with “inappropriate and racist slurs.” Headstones were toppled at a Jewish cemetery in Melrose. “It’s a wakeup call for everybody to get involved . . . because the consequences are tragic,” Eva A. Millona, executive director of the Massachusetts Immigrant and Refugee Advocacy Coalition, said in a phone interview. She said the growing numbers reflect the rise of nationalist organizations and racist, xenophobic far-right groups that encourage racial divisions. A total of 427 hate crimes were reported in Massachusetts in 2017, up from 391 in 2016, according to FBI data. Of the 2017 incidents, 232 were related to race, ethnicity, or ancestry; 118 were connected to the victims’ religion; and 65 were based on their sexual orientation. Tanisha M. Sullivan, president of the Boston chapter of the NAACP, said the statistics show Massachusetts has more work to do to combat hate crimes. Roughly 60 percent of the crimes reported nationally were based on the victim’s race, ethnicity, or ancestry, according to the report, while almost 21 percent were based on religion, and about 16 percent were based on sexual orientation. The remaining incidents were largely based on disability, gender, or gender identity, though 69 reported hate crimes affecting 335 victims were motivated by more than one bias, according to the FBI. In Massachusetts, reports of incidents based on disability and gender identity remained in the high single digits, while those of crimes related to gender identity declined, from 16 in 2016 to 9 in 2017. Mason Dunn, executive director of the Massachusetts Transgender Political Coalition, said the new statistics hit home especially hard this week. Activists are preparing on Sunday to observe the International Transgender Day of Remembrance, which was founded after the killing 20 years ago of Rita Hester, a transgender woman who lived in Allston. Dunn said the statistics don’t fully reflect violence against transgender people, particularly trans women of color. Dunn said he had heard anecdotally of transgender people who were bullied at school or discriminated against in the workplace over a ballot question to repeal the state’s two-year-old transgender public accommodations law. The ballot question was defeated by a 2 to 1 margin. Dunn said he has also has witnessed an increasing embrace of transgender people by communities and loved ones. “In many ways, things are getting better. I’m seeing more family acceptance than ever before . . . but that doesn’t necessarily mean it’s getting better across all spheres,” he said. In recent days, LGBTQ spaces in Boston have been targeted. Dorchester’s dBar and the Alley Bar in Pi Alley downtown received threatening phone calls, according to Boston police. Employees contacted police to report the incidents. But advocates said some victims of hate crimes fear harassment or violence if they contact police. They may also believe that crimes against vulnerable populations won’t be taken seriously. “It’s important for residents to see that when these situations come up, when hate crimes are reported, that they are vigorously investigated,” Sullivan said. She added that when victims are afraid to come forward, civil rights groups can help ensure that they have someone on their side. “This is where organizations like the NAACP and other social justice organizations can serve a crucial role as a bridge to law enforcement,” she said.